Ionic Framework is an open source software development kit for building mobile apps. Its purpose is to help programmers with progressive web app development in a way that feels just like building a website. Progressive web applications are built with the help of up-to-date standardized web APIs, which provide programmers with a great opportunity to create mobile apps the same way as the desktop ones. Almost all hybrid mobile apps are made with the help of Ionic nowadays. Ionic is a modern HTML5 framework for creation of mobile applications. The SASS preprocessor language is used in Ionic for the purpose of making the development process faster and much easier. AngularJS is a framework, which is also created for the sake of coding convenience as it provides quite simple connection with backend services, which is very appreciated by enterprise mobile developers of mobile applications. The latest release of AngularJS 2.0, will surely make mobile development even more popular. You’ll need three things to build an app: Ionic Command Line (CLI), Cordova to build and deploy as a native app, and a recent version of Node.js. In order to get the most out of your Ionic and Cordova development and build great iOS apps, you’ll need to install Xcode, and SDK or Android Studio for Android apps development. There are many available HTML and CSS building blocks (components) within Ionic framework, such as action sheets, buttons, cards, grid, icons, inputs, lists, menus, checkboxes, search bars, tabs and many other components. Material design (MD) is inspired by real objects and how they look, feel, sound lively. Every surface has its texture and every object has its shadow, which serves as the real-life version of the Material Design, that is now implemented in your mobile and web applications, made by Google. There were no material design software till 2014, when Google created it and performed the task greatly by making MD the trend. They’ve created framework consisting of wonderful components and patterns for developers to use in their projects. Ionic and Google shared an effort and created Ionic Material, which is a free open source project or so-called library for the Ionic framework, which allows you to materialize your mobile app without having to change the way you develop it. It will not interfere with core behavior or styles and design of mobile app will finally turn out Google-like. We have experience working with Ionic during many projects. Great examples of these are Bulldogs and Chip-in. When our customers came only with the main idea behind their backs, we started to think on design and technologies, which can be used to turn the idea into life. With experience in hybrid and native app development, we always try to use the most suitable solution for every project. If our client chooses hybrid, our choice falls on Ionic app development. In case with Chip-in, we decided to make this app hybrid so it would be flexible and available on multiple platforms. It is an app that help you save money for the goal they set and get reminded about the investments to be made, so that the users meet their deadlines and eventually save a sum enough for them to attain their goal. For project execution the development team chose a typical combo of tools widely used in hybrid development including Cordova and Ionic hybrid application frameworks, AngularJS and relevant APIs. Second hybrid project, that is worth mentioning is Bulldogs. It is an American Football Team located in Kiev. 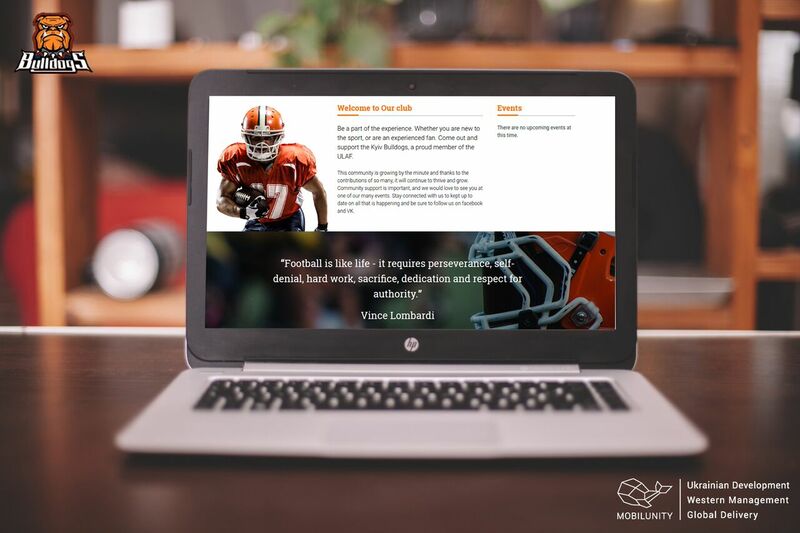 Mobilunity created a website and a hybrid mobile app for them which could serve as information portal for people involved in American football, whether they are fans or just ones who enjoy this kind of sport. To fulfill the specifications of the mobile application our developers used the same Ionic, AngularJS, Cordova, Node.js techs. If you want to have your own mobile app, contact us and we will build it! How Much Does It Cost to Hire Worker for Software Development? How Much Does It Cost to Hire LESS Developer in Ukraine?